I had some friends over for dinner last week and was cooking Indian food but couldn’t think of an appetizer. Luckily I had just received my new Food and Wine magazine and found this recipe. I thought I would give it a try and am glad I did, it was really yummy! I was going to grill the shrimp, but there was sideways rain outside, so I opted to use the broiler instead, which worked out perfectly. I just put the shrimp on a wire cooling rack and cooked them about 4 minutes per side, just until they were a little charred and cooked through. In large shallow dish, whisk the sour cream with the garlic, cumin seeds, garam masala, peppercorns, ground cumin, ginger and turmeric. Add the shrimp and coat thoroughly with the marinade. Cover and refrigerate for 3 hours. Light a grill. Remove the shrimp from the marinade and thread onto skewers; season with salt. Oil the grates and grill over high heat until almost cooked through, 2 minutes per side. Brush the shrimp with the butter and grill until glazed and just cooked through. Sprinkle the shrimp with the Chat Masala and serve with lime wedges. That looks delicious! It sounded like a long time to cook shrimp, but then I realized you've used the jumbos. 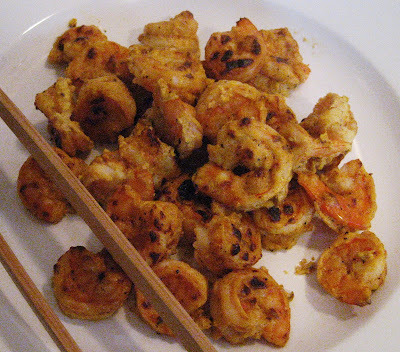 I love ur recipe...but I found an exact same recipe copied word by word including the image on http://shantipavbhaji.blogspot.com/2011/03/indian-grilled-shrimp.html. This guy copied recipes from my blog (foodnspice.com) as well. I have already filed a complaint at http://www.google.com/support/bin/request.py? I think u should do the same, so that copy cats like these are blocked.